If you have spent any time watching professional baseball, you know that sunglasses are a large part of the game. Baseball sunglasses allow for accuracy, eye protection, and of course, style. They are more important than you might think. Keep reading to learn why good quality baseball sunglasses are necessary, what to look for in your next pair, and the best baseball sunglasses to choose from today. Here is a quick look at the sunglasses on our product roundup list. We’ve got them in order of price ascending to make it easy for you to compare. Below are the top-rated baseball sunglasses on the market today. If you’re looking for cheap but great quality baseball sunglasses, RIVBOS polarized sports sunglasses are your best bet. These are backed by a lifetime breakage warranty on both the frame and the lenses. The polarization and 100% UVA/UVB protection will make sure eyes are kept safe without distorting vision. They eliminate reflections and fit snugly with the built-in grips. RIVBOS also come in many different color variations so you can buy a pair for every type of day. 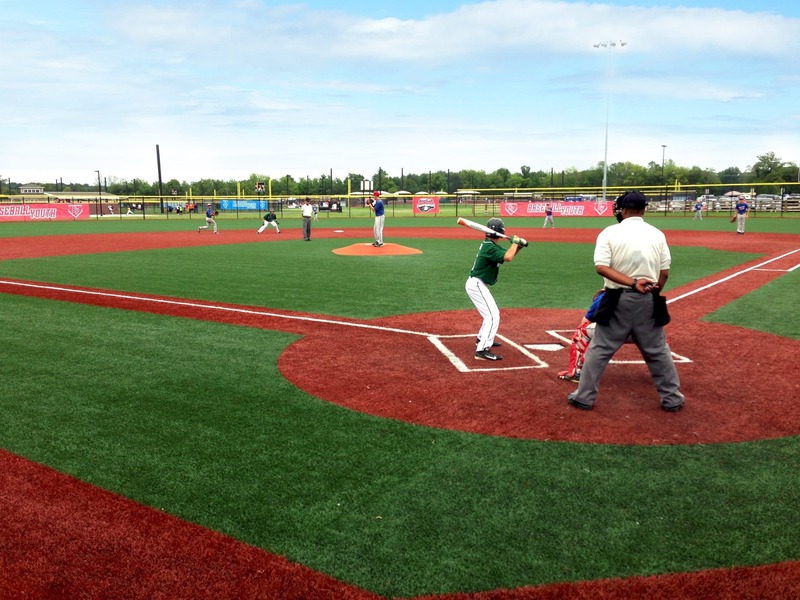 The variations also allow these shades to work for both softball and baseball players, and are some of the best youth baseball sunglasses available. HODGSON Sports Polarized glasses have many unique features that make them an excellent choice. To start, the lenses are gradient polarized which means they can change from dark to bright based on variation in sunlight or field lighting. They come with interchangeable lenses, too. So, you have many different types of sunglasses for many different types of days. The lenses are waterproof and anti-fogging–no more worrying about those humid or rainy days. One of the best features of HODGSON Sports shades is the fact that they are unbreakable. They are made out of a polymer material that is light, flexible, shatterproof, and UV blocking. These shades come with a two-year warranty, lifetime breakage warranty on the frames and lenses, and are non-expensive. Ewin E11 are the most affordable on the list, but that doesn’t mean they are not high-quality. In fact, they are definitely the best sport sunglasses for the money. These sunglasses have 7 layer lenses that are polarized, shatterproof, and offer 100% UV protection. They come with four additional lenses for different environments. The Ewin E01 sunglasses are lightweight and come with a lanyard so you don’t have to worry about losing them or stepping on them. The rubber grip will keep them secure, too. These shades also come with a 30-day money back guarantee. Under Armour Igniter are polarized and provide 100% UVA/UVB/UVC protection. Plus, they are made with polycarbonate lenses and titanium frames. This means they are extremely durable and practically shatter-proof. The lenses are resistant to water, scratching, smudging, and staining. With an adjustable nose pad and gripped framed, Under Armour Igniters can be fixed to fit snugly but comfortably. These sunglasses will make sure players look stylish while providing the best protection money can buy. 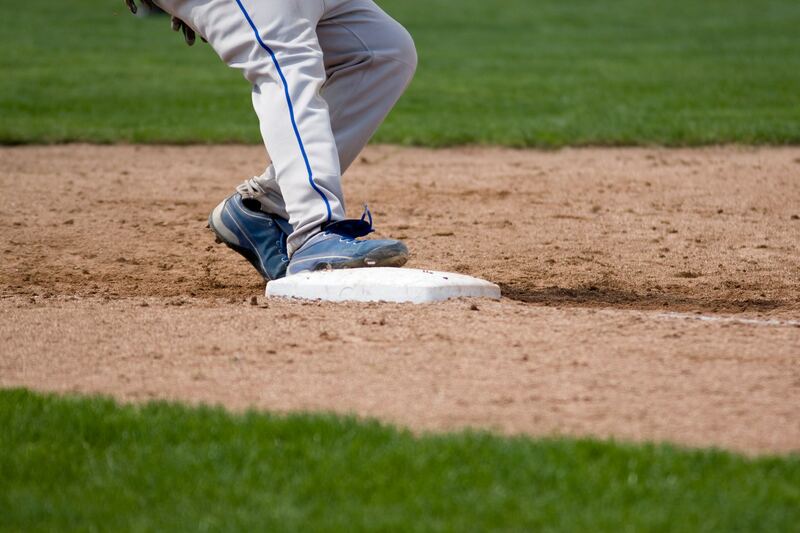 Nothing will hold you back from those practices, drills, and games. These are by far the best Oakley sunglasses for baseball, though they come with a higher price tag, they are going to last through multiple seasons. The Prizm Outfield lenses are scientifically crafted to help they eyes detect motion in the sky without the glare of the sun. These Oakley’s are perfect for those who are playing in sunny conditions on a regular basis. There are a few specifics to look for when choosing the best baseball sunglasses. They have to do with the fitting features, frames, and lenses. Fitting is the most important characteristic when searching for the best baseball sunglasses. You must make sure the glasses fit your face correctly and snugly so they don’t slide or bounce. If your glasses don’t stay on, then they won’t do you any good. Look for frames that can be adjusted at the temples and stems that are gripped. The gripping will help them stay on securely. If needed, look for baseball sunglasses that have an adjustable nose piece, too. 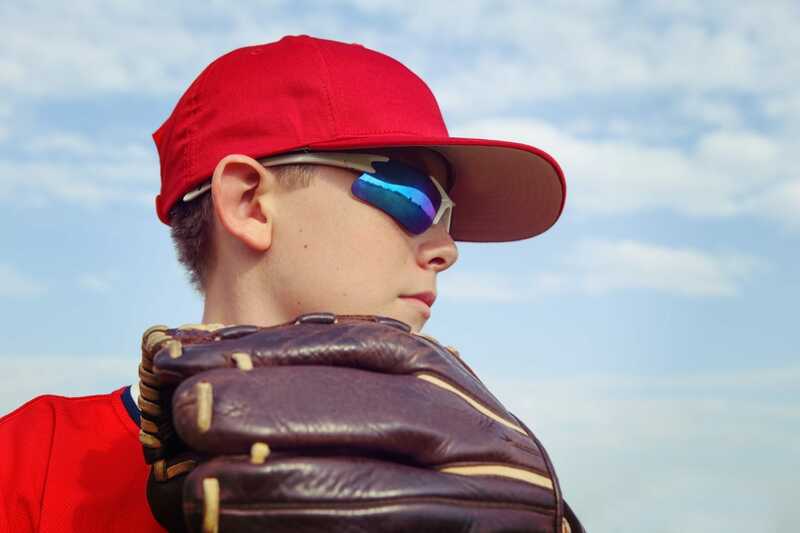 Frames play an important role in how well baseball sunglasses perform their duties.To start, choose baseball sunglasses that meet STM F803 standards. These will have shatter-resistant frames ensuring the most protection and durability. The frame material that makes the best sport sunglasses is polycarbonate. Polycarbonate frames are extremely light but also strong. Sight is also something to consider when rating frames. Make sure to find frames that do not hinder peripheral vision. Great baseball sunglasses will allow you to see the entire field while providing peripheral protection from the sunlight. Frames with rimless bottoms are best for this. Like frames, polycarbonate lenses are best. They are shatterproof and scratch resistant. Look for lenses that are at least 3mm and meet ASTM standards. It is also important to find high definition or polarized lenses. These allow for clear and improved vision while reducing reflected lights. Lenses with anti-reflective coating will also reduce glares and help you see the ball against the sun and sky. UV protective coating is also important for protecting the eyes. The best baseball sunglasses will have at least 99% UVA and UVB blockage. Clear: Clear lenses are great for night games. They protect the eyes but do not hinder vision and clarity. Grey: Grey lenses are best for sunny days. They reduce brightness and glare while preserving colors and clarity. Brown/Copper/Amber: These colors work well on cloudy days. They prevent blue light and brighten vision. This allows for better contrasting of the ball from the sky. Orange and Yellow: Orange and yellow hues let in some brightness but still protect the eyes and reduce glare. They work well on cloudy days or somewhat sunny days. Like the darker lenses, these colors make it easy to contrast ball against the sky. Green: Green lenses are perfect for sunny days. They prevent blue light, which reduces reflecting glares and improves contrasts. The lighter color keeps colors balanced but protects the eyes from the sun at the same time. Blue/Red/Mirrored: These colors have no benefit. They are simply for looks. Stay away from these colored lenses for baseball sunglasses.